In this day and age, relations between humans and machines have become rather fraught. 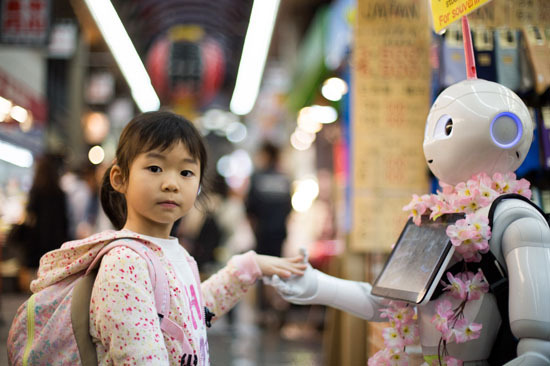 A growing number of anxieties crystallize around the use of robots and automation in various industries, not to mention our homes. Things were quite different in the late 19th century, when the introduction of the first machines were expected to relieve people from toiling away for long hours in exhausting circumstances. Families, in particular, reaped the benefits from time-saving appliances. Washing machines, dishwashers, and microwaves gradually became mass-market consumer goods throughout the 20th century. Nowadays, we worry about robots taking our jobs and becoming smarter than us. But whether we like it or not, the future spells an increasing interaction with machines in one form or another. As this trend intensifies, human-machine interfaces (HMIs) will become an ever more important technology for us to master, as they will enable us to control and interact with machines. While these three letters, HMI, might seem like just another acronym, they are one of the keys to our future world. And one of the areas where HMIs are already ubiquitous is in electricity generation and transmission. They are a key feature of grid modernization. Power grids are getting smarter, which allows them to operate in a more energy-efficient and effective manner; HMIs are typically “the face” of this process. The HMI application plays a key role in the visualization and control of substation automation systems or the monitoring of the real-time status of a solar or wind farm, for example. Engineers, technicians, and operators depend on the information collected and relayed by IEDs to get a clear picture of the state of the substation and the distributed energy resources (DER). These DERs could be wind turbines, a solar farm, or a microgrid, for example. As the power grid continues to modernize, the dependency on HMI applications will therefore increase and operators will require help to monitor and control multi-vendor systems. We will increasingly interact with machines in the future. HMI applications are built upon graphical building blocks including basic shapes, colors, text, forms, or pages to communicate and exchange information. Utilities increasingly want HMIs to work with any vendor IED, requiring minimal manual configurations. A vendor-agnostic solution would simplify installation, reduce maintenance costs, and diminish the complexity of power-automation systems. It would facilitate the interoperability with multi-vendor IEDs and support data-driven configurations that place the work burden on tools instead of human beings. Unfortunately, all the graphical components and building blocks that go into an HMI are assembled in a proprietary fashion by HMI software manufacturers. To date, there aren’t any standardized means of specifying, designing, and commissioning HMI applications. But this is about to change. The IEC is working on a new document that aims to define the configuration languages required to achieve digital substations, including the HMI application. The planned standard, which is currently being drafted, will be part of the IEC 61850 series of publications, which includes some of the core international standards used for integrating digital communication processes into the existing electrical grid. One of the objectives of the new publication is to automatically generate the HMI application, including all the associated data mappings and graphical renderings. This effectively dispenses operators, engineers, or technicians from carrying out a manual configuration of the substation system and therefore saves time and cost for utilities by using resources more efficiently. It also removes the risk of human error. “You could call it ‘magical engineering’: Instead of taking weeks, sometimes even months, to configure the HMI applications, it literally will take minutes and even seconds for smaller substations,” describes Dustin Tessier, who leads the task force responsible for the new standard project inside the IEC. The HMI document is based on a proof-of-concept technology developed by Southern California Edison (SCE), the primary electricity supply company for most of Southern California. For many in the electricity transmission industry, SCE is viewed as a compass: Other utilities follow the company’s technology roadmaps and its data-driven HMI application is just another example of its technological savviness. The HMI is part of a 3rd-generation substation automation architecture based on IEC 61850 standards, developed by the company. Mehrdad Vahabi is one of the engineers who worked on the HMI prototype. “Southern California Edison has always been a forward-thinking utility. In 2010–11, the company decided to modernize the grid. While HMIs were already used, they were proprietary, which created a number of problems including cost, the amount of manual work, and the time required to make changes to the systems. These legacy problems with HMI were one of the major reasons for moving to 3rd-generation substation automation,” Vahabi explains. During their research, SCE engineers came into contact with the IEC 61850 standards and their applications for substation automation. “They are a very useful toolset but the HMI part was not yet standardized. We got involved with the IEC experts working on these aspects. We proceeded to implement our prototype in the field and give them information, which was fed into the drafting of the new IEC document,” Vahabi adds. SCE has already started implementing the new HMI in its substations. “The plan is to automate 400 substations with this SA-3 technology by 2028,” Vahabi indicates. Further down the line, the company plans to prototype a totally virtualized substation automation system in the lab. About the IEC: The IEC (http://www.iec.ch) is the international standards and conformity assessment body for all fields of electrotechnology. IEC enables global trade in electrical and electronic goods. Via the IEC worldwide platform, countries are able to participate in global value chains and companies can develop the standards and the conformity assessment systems they need so that safe, efficient products work anywhere in the world. The emergence of smart grids is changing the way electricity is transmitted and distributed. IEC International Standards are paving the way for this transition by helping to integrate new technology such as HMIs in the existing network.